5-piece with male and female vocals. 2½ hours playing over 2 or 3 sets. Recorded music in breaks. Comprising some of the finest musicians in the UK The Vodka Martinis Jazz and Swing Band whisk you back in time which spanned the world’s first transatlantic jet service right through to Mary Quant’s revolutionary mini-skirt. Starting with some Frank Sinatra and Ella Fitzgerald swing and moving seamlessly through Latin dance, kitsch lounge and rock 'n' roll, this band can go onto to finish the night with some of the funkiest tunes on the planet! Double fronted by a fantastic female singer and male lead vocalist/guitarist, and backed by drums, bass and piano the band can expand to a six or seven-piece by adding saxophone and trumpet. The band can also provide an excellent instrumental trio of vibes, double bass and guitar or any other small combination from solo piano upwards for the earlier part of a reception. Individually band members have performed at many major film premieres, celebrity parties and charity events as well as weddings, corporate launches and festivals for clients including The Royal Family, The Jordanian Royal Family, The King Of Thailand, Johnny Depp, Leonardo DiCaprio, Kate Winslet, Tina Turner, Van Morrison, Sir Paul McCartney, Dave Stewart, Kylie Minogue, ABC, Vanessa Mae, Morcheeba, Jocelyn Brown, Bryan Adams, Claire Martin and The Tarantinos. Between them they have also appeared with Shirley Bassey, Michael Ball, Nelson Riddle Orchestra, Michael Crawford, Human League, Alison Moyet, West Life, Charlotte Church, Pet Shop Boys, Katherine Jenkins, Vince Hill, National Youth Orchestra and The Rat Pack at venues including Wembley Arena, The London Palladium, Ronnie Scotts and Brixton Academy. The band normally plays for around two-and-a-half hours divided into two or three sets, and can provide background through their PA system during their breaks. The Vodka Martinis are based in London. See Pricing for details of travel costs, etc. "Terrific - everybody commented "what an amazing band!" Fabulous." "We were beyond impressed, The Vodka Martinis were just superb, and we're a tough crowd to please being a family of professional musicians! Their repertoire was spot on, they nailed every song and no-one stopped dancing. Our venue in central London couldn't wait to get hold of their details for future events. They're a truly talented group (and such lovely people to boot), our sincere thanks to them all." "The Vodka Martinis were everything that we could have wished for and more! We wanted a fairly eclectic mix of music and they were able to perform everything we wanted. A group of truly talented individuals, totally professional and a delight to have around on our most special of days. We lost count of the number of people who commented upon the quality of the band, the mix of music and the atmosphere that they created. The dance floor was full all night. They were also reasonably priced which was a bonus!" "The Vodka Martinis were fab, they played a perfect mix of music which sounded amazing and made our party go with a real swing!" "We thought the band was great. The music got everybody up and dancing just as soon as they started to play. We appreciated that the performance had a really personal focus with the bride and bridegroom referred to by name throughout the evening. Apart from a well orchestrated, carefully prepared and anticipated 'first dance', a last dance just spontaneously happened too with everybody gathered around and the band playing wonderful music. This provided a very special and memorable end to the evening." "The Vodka Martinis were absolutely wonderful. They are such a lovely group of people and we just loved having them play at our wedding. They were our favourite bit of the whole day! Everyone loved them and their performance made it a magical evening. Thank you so much for recommending them, they are just the best." "We were extremely satisfied with The Vodka Martinis and would hire them again in a heartbeat. Their performance, already fantastic to start with, only got better as the evening unfolded. I am only sorry that our venue did not permit a longer playing time because we could have danced to them all night." "The dance floor was full all night and the band were friendly and judged their audience well. We have received many comments on the high quality of the band's performance from our guests and from the venue owners. We were extremely happy with the Vodka Martini's - worth every penny!" "Lots of excellent feedback from our guests during the night. Equipment was set up nicely and the band were really well presented. Great up beat music. Professional band that just got on with things even though we were running a bit late on the night." "Many of our guests commented on how much they enjoyed the band and their music. I had requested a particular track which I had expected to be played as part of the disco break but was delighted when Vodka Martinis played it live!" "We had 100 incredibly happy wedding guests as they danced the evening away. The band were fantastic and really made the evening fun and special. We asked them to do a version of 'All I want for Christmas' for our first dance and it worked out perfectly - nice and slow for us at the beginning and then fun and fast towards the end when everyone joined us. I only wish we could do it all again, this time I would wear smaller heels so I could dance a bit more!!! Many thanks for the most fantastic performance." 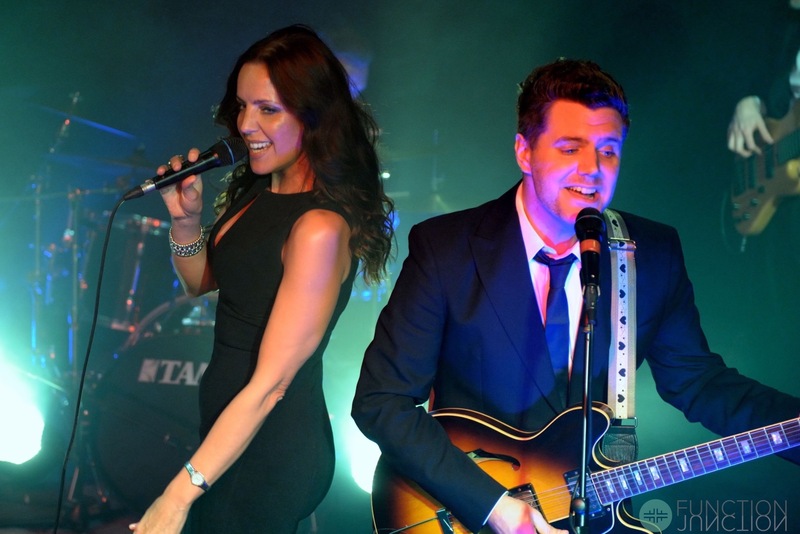 "Extremely professional, friendly and above all a truly fantastically talented band!" "We started an hour late due to speeches running over - Vodka Martinis were very kind as they took only one short break to allow as much playing time as possible. Thank you! Vodka Martinis really made the second part of the evening perfect...the music was superb...we have already discussed a possible future party with the Vodka Martinis. Thanks again." "They were fantastic! Our guests shouted for 'more' when they'd finished. They truly made our wedding reception the success it was. Mim and Steve have incredible voices and they came across as a really cool band. We loved them and wouldn't think twice about booking them again. Thankyou!!!Wow!" "The Vodka Martinis were absolutely fantastic - thank you!!" "“I am sorry its taken so long to get in touch after our wedding last month, but I wanted to say a massive thank you so much for your fab performance at our wedding. It was brilliant, and just what I had hoped for! We both had so many people come up to us afterwards and say lovely things about the band, which was great. I am only sorry I did not see you afterwards to thank you all in person! Thank you for a great performance and for making it very special for us." "A great professional act that provided everything we could have asked for and more." "We've had lots of guests saying how good the band were. Really professional - couldn't have asked for more!" "We wanted to thank you and the Vodka Martinis for the truly fabulous performance you gave at Victoria and Ben's wedding. Your music and spirit provided the joyful and warm atmosphere we had hoped for, and all the guests greatly enjoyed the songs and the dancing. It was an evening we will always remember." "The Vodka Martinis were amazing! We received many incredibly positive comments from family and friends."